Here is a philosophy: If you are going to take the time to be an entrepreneur and do a startup, why not aim to build a billion dollar company? Aiming this high is not everyone’s cup of tea, but it is a valid philosophy. If you are going to aim for a $1 billion startup, what might this look like? 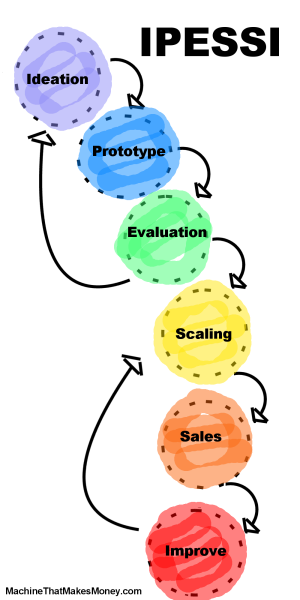 What would the prototyping phase of such a company look like? How might the full plan unfold? Tech Startup Talk with Michael Brand, co-founder and CEO of Dor. Understand the marketplace and customer needs – he has a great section on how important this step is. He determined that there are 4.5 million potential customers – retail locations – in the United States. Create a prototype and then a small run of devices and roll out to a small group of customers. Develop the software to go with it. Test the price and the revenue model. Sign up 100 customers to demonstrate traction. I – Step 1 is ideation. P – Steps 2, 3 and 4 are Protoyping. E – Having demonstrated traction by reaching 100 customers in Step 5, evaluation is easy – everything says, “move forward.” The ability to raise $3 million from VCs in Step 6 is a further positive indicator. S – The VC money plus the manufacturing phase in Steps 6 and 7 mark the scaling part of IPESSI. S – He is at step 8 in this process in November 2017 when he gives this talk, and his company will be doing the work to sell the product to thousands of customers. I – During this process there will be a version 2, and a version 3, etc., and this will be the improvement part of IPESSI. New versions, and new thresholds of traction, may prompt more investment from VCs – in other words, repeating the scaling/sales/improvement loop or the SSI part of IPESSI several times. He raised $800K from angel investors to fund the prototyping process. During this time, he stayed scrappy and lean. He and his team built the prototype hardware and software. As he mentions in the video, this required several iterations. For example, they had to try several different sensors to get the performance they were looking for. Once they had something working, they immediately tried to get their prototypes into the hands of customers. Everything did not need to be perfect. For example, battery life in the initial units was terrible, and they compensated for this by frequently replacing the batteries in the deployed units. They worked to get 100 customers on board, because 100 customers would demonstrate real traction to VCs. It will be fascinating to see how this story unfolds, and whether the $1 billion goal will be achieved. It certainly looks good at this point.